Motherhood Deleted: Meant To Be, My Foot! 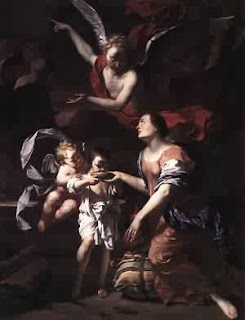 In the Old Testament, Sarah, barren after many years of marriage to Abraham, tells him to take her handmaiden, Hagar, and get her with child which they would raise as theirs and would give the old fellow an heir. Hagar was the first surrogate-to-be. But God took issue with that arrangement and, lo and behold, in her 90's (if the myth is to be taken literally), Sarah conceived Isaac, which leaves Hagar and her son, Ishmael, out in the cold. That Abraham was a cold dude. If you read the Bible, you know they put a lot of emphasis on blood lines in the more ancient texts, and natural children of both spouses were favored over the children of concubines and mistresses. Moses was watched over and "wet nursed" by his own natural mother and reverted to his own people when he observed the cruelty of the Egyptians to the Israelites. This is why I cannot get this "meant to be" and "ordained by God" idea that church-based agencies push about adoption. I named my oldest child Sarah. Her adopters named her Sara. Because of that, the adopter told me her adoption and the "as if born to" section meant that it was "meant to be" and "the work of God." As I remember, it was the work of the social workers, society and the church that took my children. To paraphrase Dickens, "There was more of coveting than covenant" in that tragedy. God/dess didn't have a dang thing to do with it. Usually, I keep my posts about the interference of religion in the legal system of our nation on my other blog, "Slightly Left of Center," but I am getting so sick of people twisting what they call the Word of God to facilitate their agenda that I had to shake a finger in their face and say, "Shame on you!" Jesus taught tolerance, compassion and love. The intolerance of his followers leaves me aghast. I doubt that the Son of the Almighty would have demanded that a mother surrender her child because of her so called "sin" of loving not wisely, but too well. Hell, his mother was single and pregnant with him. From what I have read, he understood the human condition and felt empathy and love for all of us. Of course, along came the post-crucifixion apostles, such as Paul and John, and these guys really twisted the message. From the Paulist writings and John's so-called apocalyptic visions came the fundie Puritans who were so fanatical that they murdered whole villages who did not agree with their theology. Just as the mythical Adam and Eve were kicked out of Eden, so were the Puritans invited to leave the British Isles. Lucky us, we got them and their heritage. So I defy and argue that specious idea that God is behind adoption. I am sure that God/dess looks favorably on those who take in children that need care, but trying to change what She has wrought is a bit presumptous and arrogant of humanity. I also believe that God/dess would look with approval on those who work to keep mother and child together. Gee, that would go along with the idea that natural heritage is important. Ya think? I think the biggest insult to the natural family is that misnamed "Angel In Adoption" award give out by the Congressional Coalition on Adoption. Angels don't do adoption. Self-serving, pseudo "experts, toadies to the industry and adopters, and the very misguided do adoption. So, with that in mind, I might suggest that SMAAC and other organizations institute the "Angel in Natural Family Respect and Preservation" awards each year. Anyone who has ever received the AIA award would be disqualified from this award. Adoption is an industry, one instituted and run by human beings. There is nothing of the Divine in it. To say so is not just sacreligious. It's arrogant. The people who promised me an open adoption and left me hanging after only 7 years, brainwashed my to believe the needless separation of myself and my son was "god's will". Upon our first meeting, when I told him I that I regretted ever relinguishing him, the words out of his mouth were that "god put him where he was supposed to be." The very people who conned and manipulated me out of him had not one word to say to me after I found my child. They instead frantically and in a panic (because they were afraid I had come back to claim the child taht was rightfully MINE, perhaps?) kept reiterating that it was all "gods will". I guess their "god" forgot all about me, huh? Arrogant and self entitled does not even begin to describe what people who insist this B.S. of "gods will" and adoption are...just sickening. There are Commandments about that coveting thing, and the Old Testament is abundantly clear about not taking care of your own....they can put any kind of spin on things they wish, but they know that it is wrong to cause another woman lifelong pain, but if they can blame it on God, all the better. Right on! Funny how people can't take responsibility for their own decisions and actions but say it's god's will. BRAVO! Now if we could only convince people that there are times when it is a good thing that someone does not have a child! I mean, yeah, some of those that don't have children and adopt, maybe that is why, I don't pretend to know for sure. But with all the children, now grown angry and hurt and a mess, is it not more likely that it was not meant to be? After all, why would the Universe set out to put the most wonderous of creations in harms way - and yet the ones getting children seem to be just that, harm in our children's way. and here's the story of what happened to her adopted daughter after the award and the Oprah appearance.